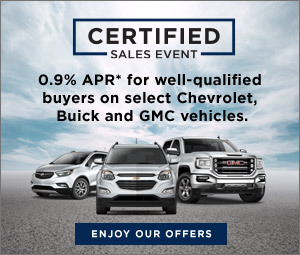 Every Certified Pre-Owned vehicle from Chevy, Buick, and GMC comes with a 6-Year/100,000-Mile1 Powertrain Limited Warranty, including Roadside Assistance and Courtesy Transportation3. We believe in our vehicles and aren't afraid to stand behind them. All of the above items are not covered for damage due to accident, misuse, alteration, insufficient or improper maintenance, or contaminated or poor-quality fuel. For complete details, refer to your Auto Warranty and Owner Assistance Information booklet.